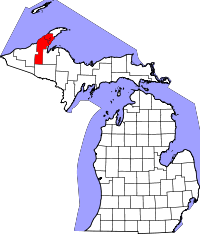 Just about the most northern county in Michigan, Houghton County keeps its vital records and genealogy resources with the County Clerk. Individuals are permitted access to the genealogy research area on weekdays during regular business hours, however space is limited to four researchers at one time. Both birth and death records are available from 1867 to present day, and marriage records are available from 1855 to the present. Interested parties can either visit the Clerk's office in person at 401 E. Houghton Ave in the second floor of the courthouse in Houghton, MI., or they can fill out and submit an order form. Each record costs $10, along with $3 for extra copies of the same one. Certified copies of birth, death, and marriage records are all available via the mail, however to simply research records, it is advised to visit the office in person.